Join the Madison Sports Ca r Club at an Autocross event! 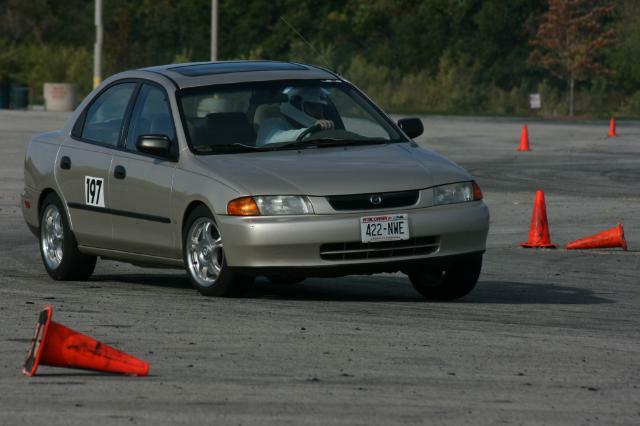 Autocross is a "beat the clock" time trial event where a driver negotiates a curvey course with their every day car! Join the Madison Sports Car Club’s Autocross Series! An autocross is a time trial event. Typically, a road course is set up using orange traffic cones in a large parking lot. One driver at a time negotiates a course laid out with the cones, or pylons, testing their skill against the clock. Time penalties are charged for hitting the cones. Afterward, your times are compared to others in your class to see what place you came in. An autocross is run in both the dry and in the rain, which often presents new challenges to drivers. Drivers learn the cars’ limits, and develop skills that help reactions in actual emergency maneuvers on the streets. For more information, please read "About the Series" and a " Typical Day."